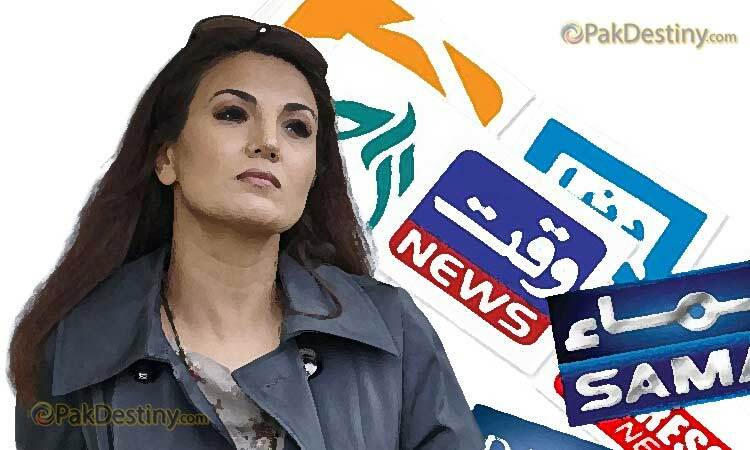 (Pak Destiny) After getting fired from Neo News Reham Khan has chosen to stay away from Pakistani media and concentrate on her film making career. Neo News of Abdur Rehman had fired Reham as her programme could not get any rating because her credential of being PTI Chairman Imran Khan’s former wife had no more attraction for the people any more. Rehman earned a lot of criticism from his employees whose salaries were compromised because he used to pay around Rs5 million to Reham. No other TV channel has so far shown interest in her thus she has chosen to switch over the career and resumed film making which she abandoned last year. She is also interested in performing a lead role in a movie she is planning to produce as well in coming months. Everybody knows Reham Khan what she did to Imran Khan and how u make his life like hell….. Reham Khan you deserve this! Reham Khan U were only an anchor but now u are reham khan Khan’s ex-wife. Channels wanted to take u desperately just because of khan sb but now u r nothing. Why would she accept that she was fired? Reham Khan has been making her movie Janaan for over 3 years now. It’s an active project, was never abandoned, and she is not “seeking refuge” in it. This is bad sensationalism. Also, the comments are vile and insanely misogynistic. Why would it take 3 years to make a film that has 0 special effects/VFX? Because movies are more than just special effects, especially when the industry has no standard practices. The reason movies can be made in Bollywood and Hollywood is because musicians are sitting with thousands of sound bites at hand, makeup artists have been practicing their art for decades, and there are streets upon streets of prop vendors. That stuff doesn’t exist in Lahore, let alone Peshawar. Have you seen the trailer? it looks like it was made by a wannabe director in college. College projects don’t have established industry support, which is why they look like college projects. Pushto movie scene doesn’t have established industry tools either.